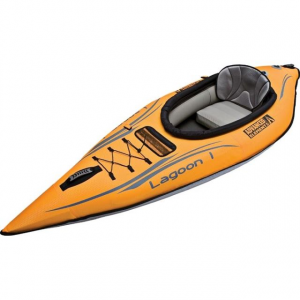 The AIRE Sabertooth R2 Cataraft - The AIRE Sabertooth R2 Cataraft is great for the challenges of big, technical whitewater. This boat turns on a dime, punches holes, and flies over waves. 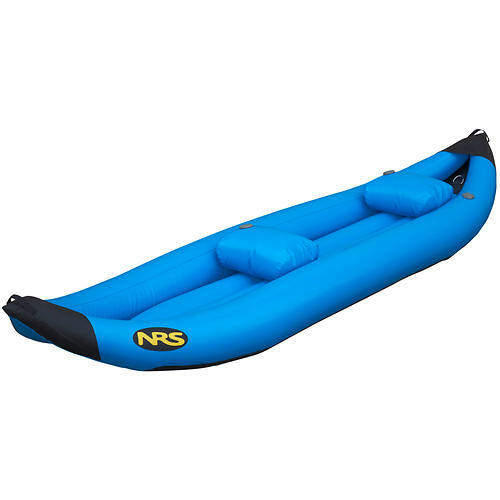 Designed with a durable mesh floor for instant draining, and an adjustable thwart so paddle teams can dial in their perfect paddling positions. Whether you're heading to Mosier Falls, Oregon, or the Cheoah River in North Carolina, the best river rafting takes place when you've your first mate aboard. 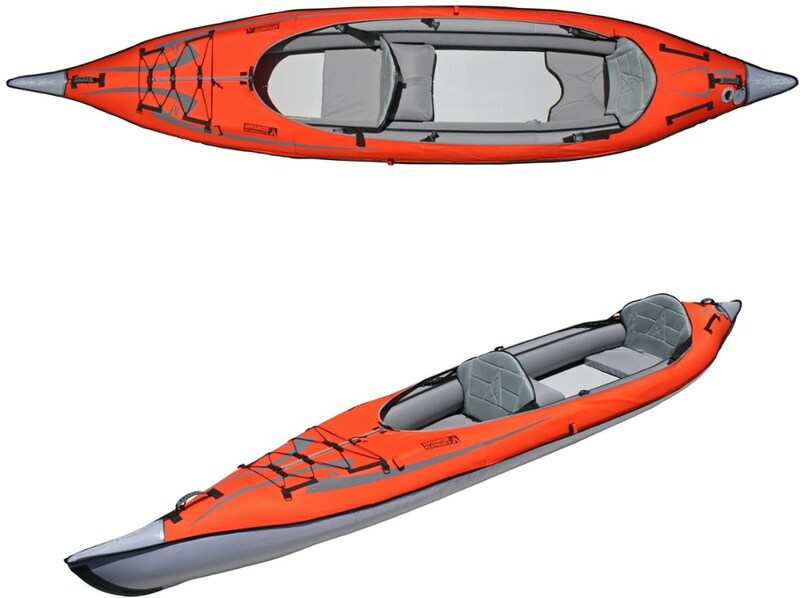 The frameless Aire Sabertooth 12 Cataraft is spunky enough for rigorous rapids but knows how to kick back when you and your main squeeze want to hit the water for a mild weekend of floating and fine dining on the water. Even if your BFF prefers rawhide bones and couches to gourmet crackers and blended scotch, throw Monseir Poochness into the center of the boat and enjoy a great day on the water. 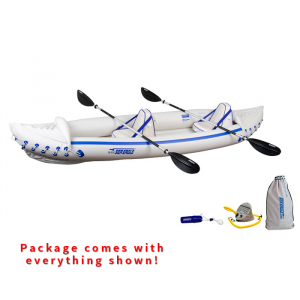 Designed for two-person whitewater rafting, the Sabertooth is a blend between inflatable raft and rugged catamaran. Two massive tubes, each filled with two urethane AIREcells, keep you atop the water. 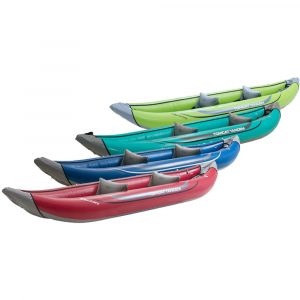 The PVC mesh floor connects the two tubes to create a boat built for you and a paddling pal. The mesh floor only goes a meager 11. 5 inches deep so you need not worry about too much drag slowing you down. Welded construction eliminates seams and sources of weakness to give you paddling pleasure for years on end. Both ends of the boat rise up a wicked 29 inches to crawl over rocks and holes and fight back when the rapids get rowdy. A removable foam knee pad protects your patella if you prefer to straddle the thwart (as opposed to sitting side-saddle). Built-in floor foot cups aren't in case your tootsies get thirsty, but rather provide the means by which you get a touch more stability. Six D-rings on the outside of the tubes let you cool your brews when easy-going floating is the order du jour. Or you can attach a rescue bag, too. 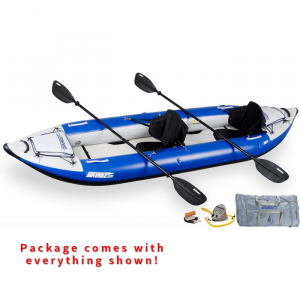 Four D-ring handles on the inner aspect of the tubes making two-person boat-toting a reasonable endeavor.